Great websites aren’t just about fancy design or modern tech. They incorporate a lot of elements that harmoniously come together to create an excellent experience for your users. A great website is one that accomplishes a purpose for you. 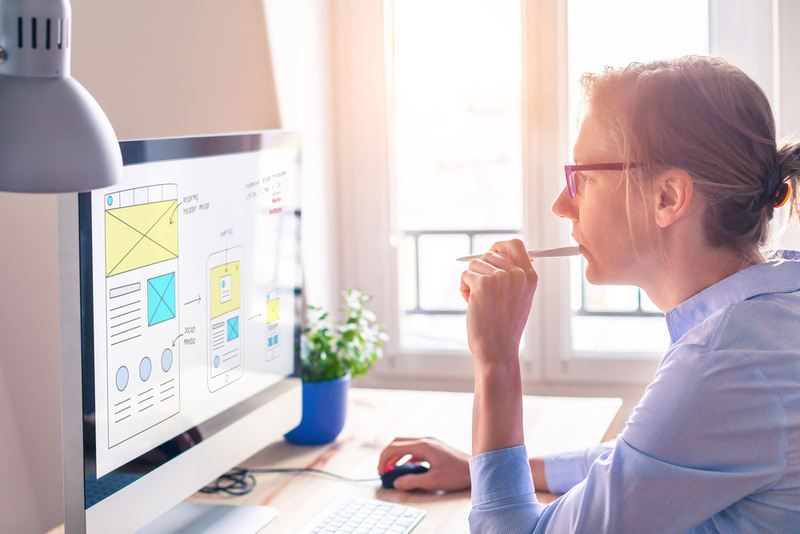 This purpose can be one or many things, but before you even think about starting the design of your website you need to define clear goals for it. Establish your brand – help you stand out in your industry and emphasise your brand’s voice. Build social proof – using customer testimonials and reviews to impress potential buyers. Take on your competitors – all of your competitors have websites. Your customers are expecting you to have a site and without one, you seem like an unestablished brand causing your customers may go elsewhere. Provide information – give information to current and potential customers about your brand, and your products or services. Generate leads – you want users to fill out and submit a form that will collect their contact details. Sell products – you run an e-commerce store and use your site to generate profit. Whatever your site is trying to achieve, it is vital that you are aware of what its goals are so we can tailor the design to your needs. If you want a high converting website, you need to know who your audience is. Understanding your ideal customer means you know what they love and what they hate; this will influence the design of your website massively. Different audiences will have a different preference. You are not trying to build a website that everyone will love but one that a specific group of people will enjoy. The more data you have about your audience, the easier it will be to create your website. You will be able to make informed decisions in the design process to ensure that your site will deliver results. If you don’t have a defined audience and create a website design, you are just taking a stab in the dark meaning the time, and money you have invested in your website will not see any return. When thinking about your audience, there are some key things you should consider. Navigations need to be easy to use and put in a consistent location (often the top right corner of your site). The navigation is not necessarily the area of your site where you want to get creative and try something really out of the box. Your users need to know how to use your navigation immediately. The average user makes a decision within 5 seconds of landing in your site to whether they’ll continue using it. If a new user arrives at your site, you do not want them having to spend time trying to figure out your how to navigate through it because you will lose them. You need users to easily be able to find the information they are looking for, and a confusing navigation will cause users to leave your site before they find it. There is no need to reinvent the wheel; conventional navigations work for a reason. Users already have a mental model of how a navigation should look; most of us can arrive on a website that is in a completely different language and still figure out its menu because this design convention works so well. Visuals are important. You only have a split second to make a first impression when a user clicks on your site. How many times have you immediately clicked back from a website without engaging with any content just because the website looked dated or ugly? Probably quite a few. Fonts and colours are two of the most powerful subliminal visual tools you have to influence your user experience. You should never choose them on a whim – think carefully about what your audience will respond to best and if possible conduct A/B testing on various colour palettes. Images are another crucial visual tool, as the saying goes ‘a picture is worth a thousand words.’ But the wrong picture can tell the wrong story and be a waste of precious screen space. You need images that will appeal to your audience, whether that be diagrams, infographics, photographs or illustrations. They all need to add value to your visitors and keep consistent with your message. Many brands chose to use stock photography but if they do not use a designer to help them select their images they can do more harm than good. Stock photography can often be forced, looking unnatural and staged. These images can make your website look spammy and your brand untrustworthy. Great content is what will separate your site from the millions of others out there and will be the reason your users keep coming back. Your content should be clear, relevant and keyword-rich. You need to create content with information that cannot be found anywhere else and is unique to your site. But this does not mean you should always create long-form content. You should be able to get across your message in the simplest way possible making it easy for visitors to find the information they want. Your content serves a purpose – to engage your users, drive traffic to your site and to improve your organic SEO. Frequently published, informative and easy to digest content will give your brand exposure, opening up new audiences for you and bringing you high converting quality traffic. Different audiences will respond to varying forms of content. If you are a lead generation site, you need content that motivates visitors to put in their contact information; this could be ebooks, product demos, webinars etc. If you are trying to build brand awareness, you will want content that can be easily shared and consumed such as images, blog posts and infographics. It’s also worth considering video as it combines both audio and visual. Video gives you a better medium to tell your story and in general audiences are more receptive to it, remembering 95% of a message when watched vs 10% when read. You need to establish what your visitors want and provide them with solutions to their problems. People are more likely to read and share content when there is something in it for them, so you need to be providing value. Most of the time prospective customers first visit to your site will not be enough to convert them. High-quality content motivates them to keep coming back to your site and therefore increases your sales over time. User-friendly design is the most essential part of website design. It can not be expressed enough that your website can be as ‘fancy’ as you like or have the most amazing content on the web but if your user cannot interact with it easily then it is entirely useless. Readability – users should easily be able to scan your website. There needs to be a clear hierarchy with headings, subheadings and body text. Do not bombard users with content, trim it down to only include what’s necessary. Another factor in readability is visuals; text should contrast with your background colour and be a size that all visitors can read. Load time – 47% of consumers expect a web page to load in 2 seconds or less. Visitors are impatient and want to see immediate results if your website does not perform well they will go elsewhere. CTAs need to be strong and relevant, immediately catching the attention of your visitor. Your conversion rates and revenues depend on the power of your CTAs. They need to entice your visitor into taking the next desired step to purchasing so you need to be creative when thinking about the placement, design and copy for your CTAs. All websites need to be mobile friendly. Mobile web usage has now overtaken desktop so no matter what industry you’re in, mobile-friendly design needs to be part of your website plan. By having a mobile friendly website you open new doors for your business, being able to enhance your visitor’s experience and having another avenue to finish an online conversion. Giving your visitors a seamless experience across devices will build trust with them and lead to a higher Customer Lifetime Value. Not only is a mobile-friendly site great for your customers it’s now an essential part of Google’s SEO ranking algorithm. Mobile friendly websites are favoured and displayed higher in Google search rankings. Mobile usage shows no signs of slowing down. If you don’t already have a responsive website, you need to get one, or you could find your business becoming obsolete. You need all the above elements to come together to create a successful website. Design itself does not sell, and neither does content. A beautiful site with boring or irrelevant content, an ugly hard to navigate site with compelling and informative content; they are both as useless as each other. To create a website that achieves your goals and helps generate revenue for your business you need to include all the elements above build your site with a purpose and your audience in mind.